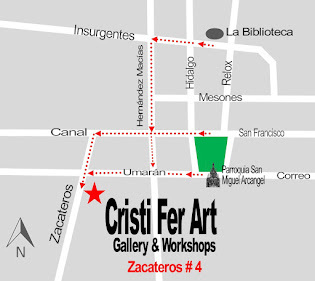 Cristi Fer Art Gallery and Workshops, in San Miguel de Allende, Mexico: Not only lots of fun at Cristi Fer Art Workshops we learned a lot! Not only lots of fun at Cristi Fer Art Workshops we learned a lot! So of the happy faces of our workshop participants in one the November workshops 2017. "I recently took an art class at Cristi Fer Gallery in SAN Miguel. Every day Cristiana and Fernando offer a different type of class, and I chose to paint the doors of SAN Miguel. Anybody familiar with SMA knows that most doors there are beautifully carved and sometimes very colorful. Fernando was an awesome teacher and very patient, too, considering I had never taken an art class in my life although I am 68 years old. I'm very fond of their styles of painting and even bought two of their pictures to complement my own. When I return to SAN Miguel next summer, I will surely take another type of class with them. The whole experience was enjoyable and fulfilling too!" 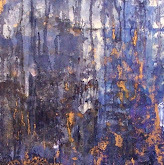 "I reached out on short notice just prior to my visit to SMA to see if i could arrange some time in the studio. Cristi was very accommodating and was able to fit me in for a 2 day - 4 hour class session with Fernando. I got a lot out of my time there. Fernando is a great teacher and would recommend this experience to anyone interested in painting whether first time or some one who simply wants to work on technique. You won't be disappointed." Also thank you to all who bought our paintings in our first month at the new location! You helped us make our first month a success!